Never did I think my wine-stained teeth would be the mark of an athlete. But a new study published in American Journal of Health Promotion, says the more people drink, the more likely they are to exercise. “Alcohol users not only exercised more than abstainers, but the differential actually increased with more drinking," said Michael French, a professor of health economics, according to USA Today. 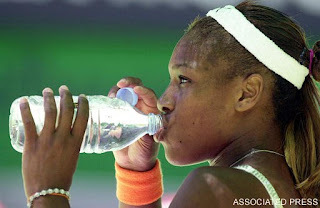 Maybe that's not just water Serena's drinking. For women, those who liked to “bend the elbow” exercised 7.2 minutes more a week than sober survey participants. I wonder how many are sauced up on the elliptical. That might be dangerous. But maybe a tipsy workout is where it’s at. You probably wouldn’t “feel the burn” as much. I think they’re onto something here. What do you think? Does this sound right to you? Do you like rum AND running? This entry was posted by kate, on Thursday, September 17, 2009. You can leave your response .